Mincy Moffett came to terms with a tough reality when he was in his late twenties. He had an undergraduate degree in economics from the University of the South, or “Sewanee,” an MBA from Georgia State University, and a job with upward mobility at Georgia Federal Savings and Loan in downtown Atlanta, but he was miserable. “I had a career that I hated and two degrees that I didn’t want to use anymore, so I thought, ‘Man, I’ve got to make a change,’” said Moffett. Moffett decided to take a break and head north to Washington, D.C. He stayed with his brother for a month, which was time Moffett used to evaluate his career options. He was hired by Greenpeace USA, which is an organization that uses peaceful protest to call attention to environmental problems and work for solutions. For seven years, Moffett worked for Greenpeace, rising to administrative director, utilizing skills he had acquired from his time spent in higher education, including his business acumen, leadership, financial management and rock climbing. That’s right. Rock climbing. Moffett and fellow Greenpeace USA volunteers scaled the Du Pont Chamberworks water tower between I-95 and I-295 along the Delaware River and hung this blue-ribbon banner in protest of the company’s production of CFCs, or “Freon.” Photo by Robert Visser, Greenpeace. In addition to being paid for his administrative work, Moffett volunteered to participate in many nonviolent acts of civil disobedience. He had done some rock climbing in high school and college, so he often served as one of the organization’s protest climbers. Commonly referred to by the Du Pont brand name “Freon,” CFCs are chemicals primarily used as refrigerants or in aerosol cans. In the mid-1970s, CFCs were scientifically linked to chemical depletion of the ozone layer around the earth. Damage to the ozone causes an increase in ultraviolent radiation, which can have numerous adverse effects, including a rise in the incidence of skin cancer. As a result, by the mid-1980s, concern and protest over the production and use of CFCs had reached a fever pitch, especially amongst environmental organizations like Greenpeace. 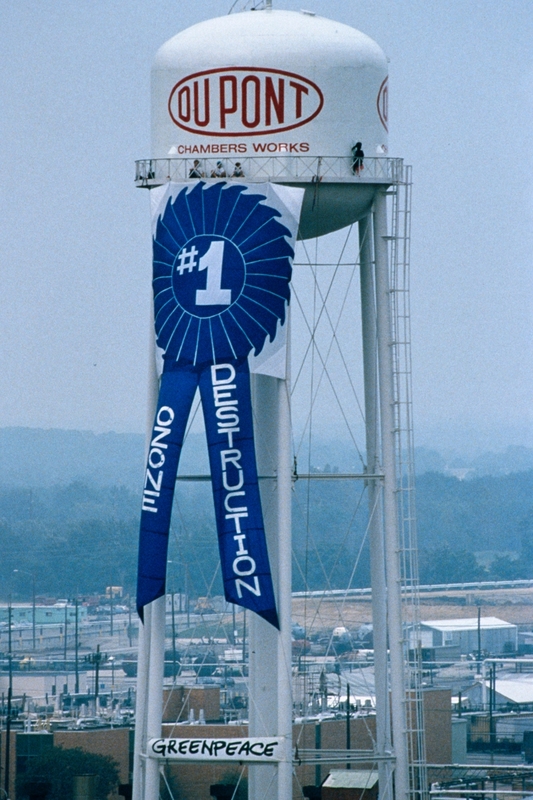 Moffett’s Du Pont water tower climb took place in 1989, and the banner was 65 feet tall. Moffett and two other Greenpeace volunteers stayed on top of the 180-foot water tower for three days in protest of the manufacture of CFCs. They locked the ladder cage on the tower using steering wheel locks so no one could climb up and try to force them down. News helicopters hovered near the tower so they could interview Moffett and the other protestors. “We got the word out,” said Moffett. As a volunteer with Greenpeace USA, Moffett rappelled down the side of The World Bank building on Pennsylvania Avenue in Washington, DC, as he unfurled this banner protesting the bank’s role in funding projects that resulted in deforestation, damming free-flowing rivers and displacement of native peoples. Photo by Jay Townsend, Greenpeace. The World Bank United States headquarters in Washington, D.C., was another target of Greenpeace protest. In July 1994, the USA Today building was located next to The World Bank building. Moffett and fellow volunteers dressed like elevator repairmen and took the elevator in what was then the USA Today building to the top floor where someone let them onto the roof. The protesters used the window washing arms as the basis for hooking up the rappel gear and the banner. Then, they put the window washing arms over the side of the building and rappelled down, unrolling a 60-foot banner along the way. 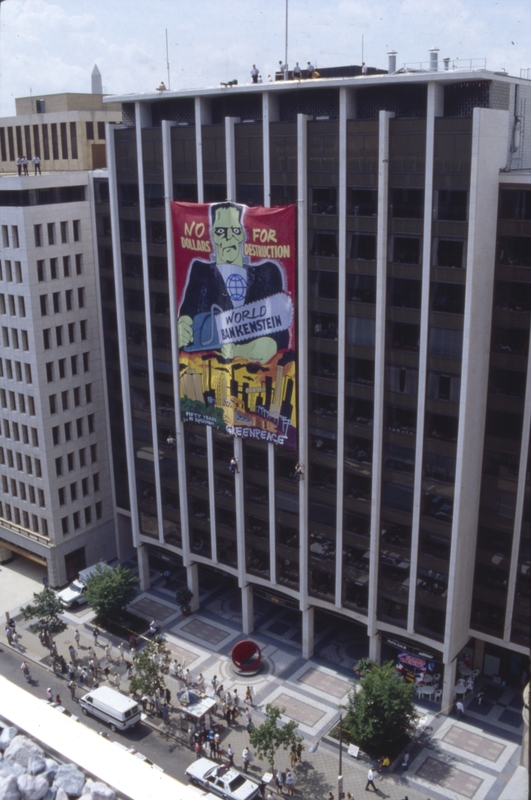 The banner featured a “World Bankenstein” creature holding a chainsaw with the words, “No Dollars for Destruction.” The Greenpeace activists were protesting The World Bank’s role in funding projects that resulted in deforestation, damming of free-flowing rivers and displacement of native peoples. Moffett, who had always loved plants, decided he wanted to become a plant scientist. The problem? He had no science background whatsoever. Moffett and his wife moved to Stone Mountain, Georgia, and lived with Moffett’s dad in the family home. For two years, Moffett attended Georgia State University and took basic biology, chemistry and physics, as well as served as an undergraduate teaching assistant and assisted with several research projects, all in an effort to build his credentials for graduate school admittance. Moffett ultimately decided to come to Auburn in large part due to his initial impressions of Biological Sciences Professor Robert Boyd. 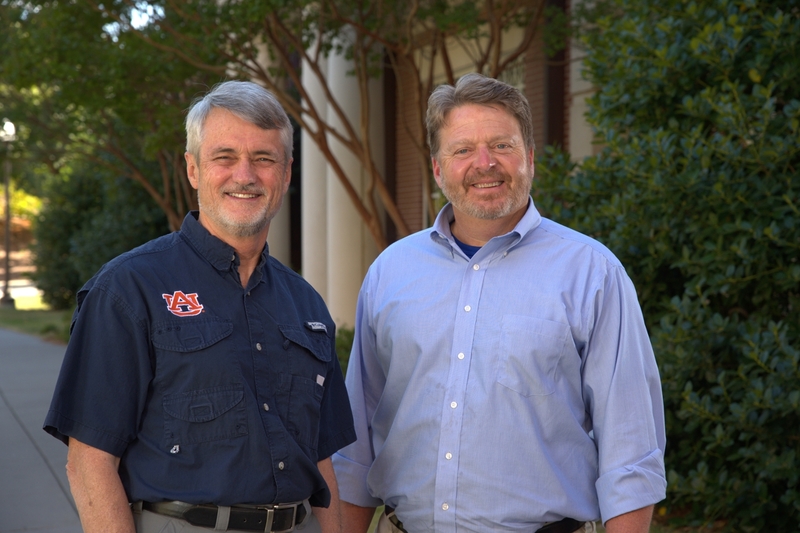 Biological Sciences Professor Robert Boyd (left) directed Moffett during his doctoral graduate studies. The two have remained close and often collaborate on plant conservation efforts. Due to the hurricane, Moffett and the others had to spend several days at the research facility after their work was complete. Boyd’s lab is divided into two sections. One side of his lab focuses on research into how certain plants take up toxic levels of metals, how these plants are able to survive, and the plants’ relationship with insects. The other side of his lab is centered on plant conservation research, and this is where Moffett spent his time and energy. Moffett is now a rare-species botanist with the Georgia Department of Natural Resources, Nongame Conservation Section where he: conducts rare species surveys; restores and manages rare habitats on state, federal and private land; reintroduces rare species back into restored habitat; serves on the prescribed fire team; and conducts education and outreach programs for all ages and a variety of groups. Along with his work with the Georgia Department of Natural Resources, Moffett serves on the board of the Georgia Exotic Pest Plant Council, the steering committee of the Bog Learning Network, and spends countless hours providing leadership for the Georgia Plant Conservation Alliance, or GPCA. The GPCA is an umbrella alliance in the state of Georgia that has as its members any institution that is responsible for, or interested in, plant conservation. The alliance currently has approximately 40 members including state and federal agencies, non-governmental organizations, utility companies, academic institutions, arboretums and botanical gardens. The efforts of GPCA were recognized by the Association of Fish and Wildlife Agencies, a non-profit 501(c)(6) organization that promotes and advocates on behalf of the fish and wildlife agencies of the states, territories, and provinces of North America. The GPCA was presented with a national Award of Special Recognition, an extraordinary accomplishment since plants are not recognized as “wildlife” by either federal agencies or most state fish and wildlife agencies. Moffett explained that excluding plants from the definition of wildlife dates back to English Common Law and the tradition that the king owns anything that moves; but the feudal lords own anything that is rooted. The tradition carried over into U.S. law. 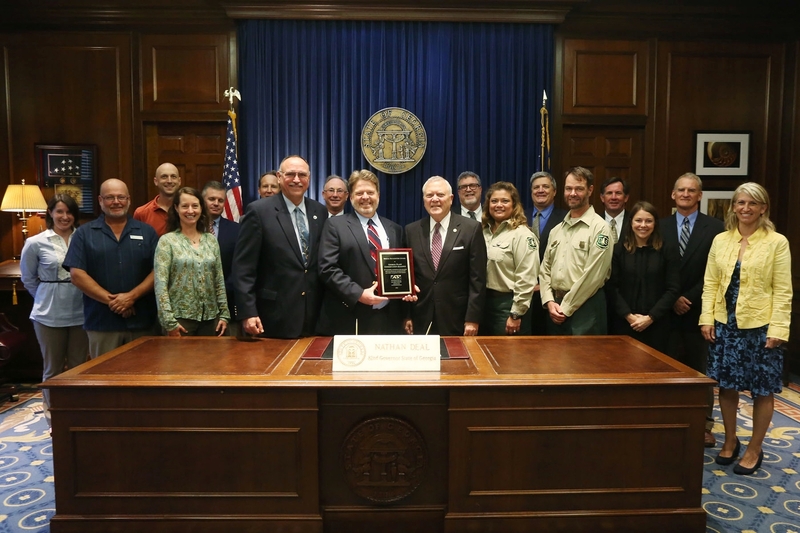 Moffett (center, left) holds a plaque that was presented by Georgia Governor Nathan Deal (center, right) to the GPCA for the Association of Fish & Wildlife Agencies Award. To the left of Moffett is Rusty Garrison, the Director of Wildlife Resource for the Georgia Department of Natural Resources. The unprecedented award recognizes a plant conservation group for the first time; it honors GPCA efforts over the past twenty-two years, many of which Moffett conceived or improved, including the better utilization of the resources, knowledge, and work plan of GPCA to help implement the State Wildlife Action Plan for Georgia. A wildlife action plan serves as a state's comprehensive plan for managing and conserving species and habitats before they become too rare or costly to restore. A wildlife action plan is also a requirement for eligibility in the federal State Wildlife Grant, or SWG, Program. Funding from SWG is the lifeblood of nongame programs in state fish and wildlife agencies. Nongame programs focus on the conservation of thousands of plant and animal species that aren’t hunted or fished. In Georgia, the Department of Natural Resource’s Nongame Program relies on SWG funding for one-quarter of its operating budget. State Wildlife Action Plans are prepared by all U.S. states, districts and territories. The GPCA helped develop the plant portion of the Georgia State Wildlife Action Plan. Numerous states are looking to Moffett’s expertise and GPCA for guidance on establishing similar organizations, including Alabama, which established the Alabama Plant Conservation Alliance in 2009. The award of recognition also honors the safeguarding efforts of GPCA as they work to collect seeds or propagules of rare plants, grow them in a protected place, like an arboretum or greenhouse, and eventually grow enough of them to put some back into the wild. It’s an effort to warehouse genetic diversity, spread the extinction risk across a greater number of locations, and restore rare species to a place of ecological relevance in nature. Although Moffett has rappelled down buildings and camped out on top of a water tower, it is the award presented by the Association of Fish and Wildlife Agencies that has meant the most to him in his professional career.